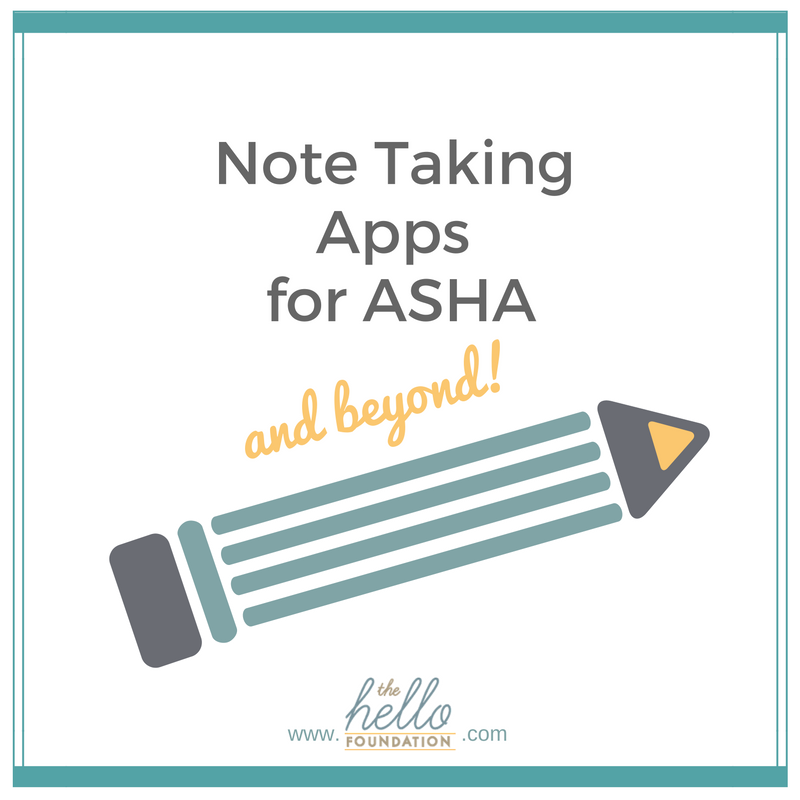 Want to simplify your note-taking and stay organized at the ASHA convention this year? There are some great apps for that. We’ve got you covered some technology-forward tips for ASHA and all of your professional development events to come! Try Tripit as your personal travel assistant. Tripit will keep all your travel itineraries in one place – you can forward emails with your reservation information to your Tripit account, and they will organize it all for you. To make sure you don’t forget anything before you go, Packpoint and TripList are fun packing apps. Enter where you are going, for how long, and what activities you will be doing (swimming, fancy dinner,etc) – they will create an editable packing list for you. Granted, they don’t have “ASHA” as a packing option, but as long as you remember that you’ll be walking literally miles each day and that Professional Comfortable is the dress code, you’ll be in good shape! While you’re there . . . If you are looking for a way to organize your handouts and lecture notes, there are some great handwriting apps to replace your pen and legal pad. Evernote and Simplenote allow you to type or handwrite your notes, and organize them into “notebooks” or categories. Both of these apps will sync across devices, so you can access them from your laptop, smartphone, tablet, etc. Plus, you can take photos of posters, important slides and handouts to keep with your notes. Prefer a more integrated note taking experience? Notability and Goodnotes are excellent handwriting apps for iOS – you can also take a picture of a handout or slide and then write on that image. A really cool thing about Notability is that is allows you to sync voice recordings with your notes. This means that you can record a lecture and see your notes taken in real time while listening to the audio. When you come home . . .
Don’t forget to fill out your CEU form online to get the credit you deserve! All of the apps listed above can also be great for organization at work after you get back! Evernote is particularly nice for organizing, as you can have all of your ASHA notes in a single notebook, and then tag the individual notes with descriptors (like artic, pragmatics, cool research, or whatever you’d like) that will let you access them quickly and easily. Enjoy your time at the convention!